Traffic congestion has become one of the major society issues in many urban areas around the world. It greatly increases the commuting time and fuel consumption. Researchers have proposed many solutions in different aspects to alleviate this issue. In recent years, many works adopt Vehicular Ad Hoc Networks (VANETs) to relieve the problem. Vehicles with communication ability can receive traffic information from infrastructures or other vehicles. Furthermore, drivers can select its driving path by avoiding congestion areas based on the real-time information. However, to speed up the procedures of information collections, many existing works suggest proactive messages to acquire traffic information from other vehicles, which incurs heavy communication overheads. In this work, we propose a real-time traffic collection mechanism, which adopt both proactive and passive schemes. Vehicles passively collect traffic information in most of the time, and proactively broadcast the traffic data only in certain situations in order to speed up urgent information spreading. Thus, vehicles can obtain real-time traffic information in a low-cost way. In addition, we propose a routing planning scheme, which considers travel time, reliability, expected traffic flow as well as other factors, to select reliable and fast routes for vehicles. The simulation results show that, comparing with previous works, the proposed schemes can find better driving paths for vehicles with lower communication cost. D. Schrank, B. Eisele, T. Lomax, and J. Bak “2015 urban mobility report,” The Texas A&M Transportation Institute and INRIX, August 2015. S. Al-Sultan, M. M. Al-Doori, A. H. Al-Bayatti, and H. Zedan, “A comprehensive survey on vehicular ad hoc network,” Journal of Network and Computer Applications, vol. 37, pp. 380-392, January 2014. C. Englund, L. Chen, A. Vinel, and S. Y. Lin, “Future applications of vanets,” In Vehicular ad hoc Networks Springer International Publishing, pp. 525-544, 2015. M. J. Booysen, S. Zeadally, and G. J. 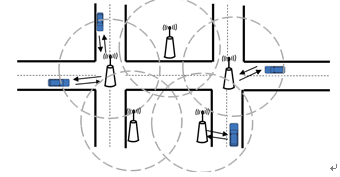 Van Rooyen, “Survey of media access control protocols for vehicular ad hoc networks,” IET Communications, vol. 5, no. 11, pp. 1619-1631, 2011. E. Uhlemann, “Introducing connected vehicles,” IEEE Vehicular Technology Magazine, vol. 10, no. 1, pp. 23-31, March 2015. M. Chaqfeh and A. Lakas, “Shortest-time route finding application using vehicular communication,” Proc. IEEE Wireless Communications and Networking Conference (WCNC), November 2014. C. F. Huang, Y. F. Chan, and R. H. Hwang, “A comprehensive real-time traffic map for geographic routing in vanets,” Applied Sciences, vol. 7, no. 2, January 2017. R. K. Ganti, F. Ye, and H. Lei, “Mobile crowdsensing: current state and future challenges,” IEEE Communications Magazine, vol. 49, no. 11, November 2011. J. Lin, W. Yu, X. Yang, Q. Yang, X. Fu, and W. Zhao, “A real-time en-route route guidance decision scheme for transportation-based cyberphysical systems,” IEEE Transactions on Vehicular Technology, vol. 66, no. 3, March 2017. D. Krajzewicz, J. Erdmann, M. Behrisch, and L. Bieker, “Recent development and applications of SUMO - simulation of urban mobility,” International Journal on Advances in Systems and Measurements, vol. 5, no. 3-4, December 2012. A. Wegener, M. Piorkowski, M. Raya, H. Hellbrück, S. Fischer, and J. P. Hubaux, “TraCI: a framework for coupling road traffic and network simulators,” Proc. of the 11th Communications and Networking Simulation Symposium, IEEE Press, April 2008. M. Haklay and P. Webber, “OpenStreetMap: user-generated street maps,” IEEE Pervasive Computing, vol. 7, no. 4, October 2008.